Last week, the Nevada Secretary of State, Republican Barbara Cegavsky, announced that she had cleaned the state voting rolls as “routine maintenance” for the month of October. This routine maintenance removed 36,090 actively registered voters from the voting rolls and of this total, 17,616 were actively registered Democrats voters. These may not seem like large numbers, however, the state of Nevada is not a densely populated state and only two counties in the state drive our representation: Clark County (Las Vegas) and Washoe County (Carson City) where many districts can be decided by a handful of votes. President Donald Trump only lost Nevada by 27,000 votes and many of our incumbent Republican legislators lost by less than 1,000 votes. The National Voting Rights Act (NVRA) requires states to complete any systematic programs to remove ineligible voters not later than 90 days before any federal election. Additionally, Nevada is a founding member of the Electronic Registration Information Center (ERIC), a nonprofit organization assisting states to improve the accuracy of their voter rolls. Every 60 days, Nevada’s voter registration records and DMV records are uploaded to ERIC and compared against data supplied by the other 20 participating ERIC states (including Washington, D.C.), the Social Security Death Index, and the U.S. Postal Service’s National Change of Address database in an effort to identify deceased individuals and those registered to vote in more than one state. Any potential duplications or deceased voters are reported to the Secretary of State’s office and local election officials for further investigation and processing, and as appropriate, removal from or correction of the voter roll. Which begs many questions: how many of these ineligible Nevada voters were on the rolls and able to vote in the 2016 election? How many of these voters did, if any, vote in the 2016 election? 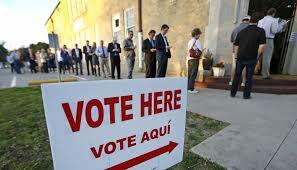 Of these ineligible voters, how many of them were not US citizens? Was the Secretary of State able to access immigration data, provided by the Department of Homeland Security, for this routine maintenance? 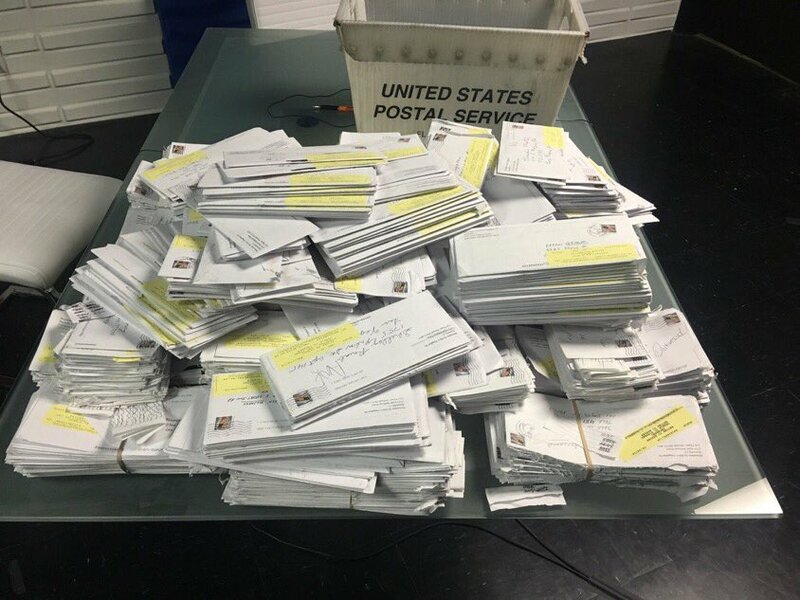 As I have previously reported, a Republican candidate in Assembly District 15 in Nevada sent approximately 10,000 campaign mailers to actively registered Democrats in his district through first class mail. The United States Postal Service returned 3,000 envelopes to his campaign. To date, we have not received an update from the Nevada Secretary of State or the FBI on their findings from these envelopes. Of equal concern, we do not know if the sample ballots sent to these registered voters were tagged and inventoried according to federal post office procedures. George Soros’ PLAN Nevada, who blocked me on twitter (imagine that), and Hillary Clinton targeted Nevada, a swing state, by working with illegal immigrant rights organizations, Harry Reid and powerful unions to promote illegal immigrant activation and voter registration. Meet Astrid Silva. Astrid refers to Harry Reid as her abuelito (grandfather), yet in the many years of their close relationship, her powerful abuelito didn’t help her become a citizen. In 2016, Astrid was a featured speaker at the Democrat National Convention. Astrid, a millennial Dreamer, was now nationally known and publicly tapped by the Hillary campaign to get out the vote in Nevada. By law (when and if it is enforced), you have to be a citizen to vote in national elections in this country, but you evidently don’t have to be a citizen to register people to vote. Did Astrid actively register voters? 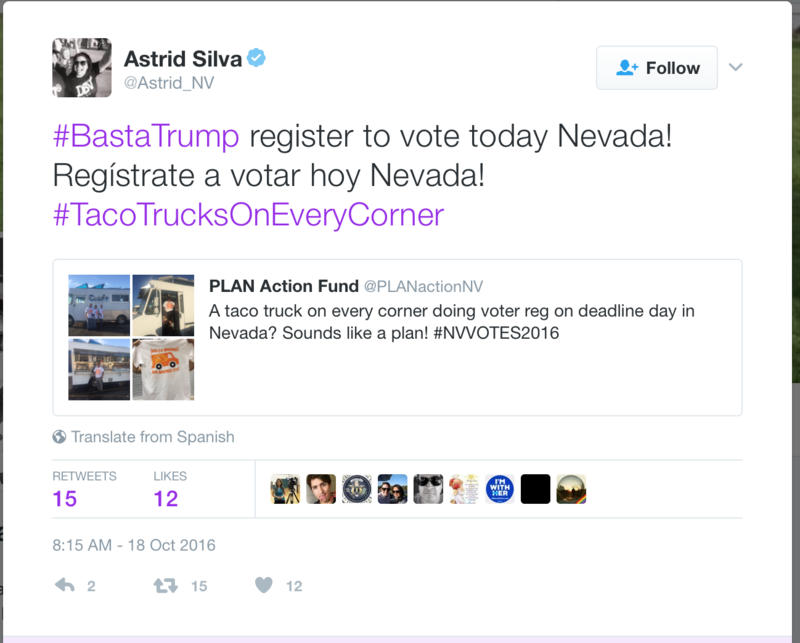 Did Astrid/PLAN Nevada check for citizenship when registering new voters? Was Culinary Union 226 and there “taco trucks on every corner” checking citizenship when registering voters, or were they knowingly registering anyone and everyone to overwhelm the Secretary of States office with the legal responsibility of voter roll maintenance? Furthermore, in April 2016, Governor Terry McCauliffe, through executive order, restored voting rights to over 200,000 felons–unilaterally amending Virginia’s Constitution which has prohibited felons from voting since the Civil War. Driven by the Census, noncitizens and illegal aliens are counted when apportioning congressional districts and when allocating state electors under the Electoral College. This means noncitizens play a role in determining how many congressional representatives a state has and exert an indirect influence on presidential elections. Russian influence in the outcomes of the 2016 election has proven to be non-existent, but the illegal influence in our elections is well-documented and spans over many decades. Until there is transparency, the citizen voter will be disenfranchised as his vote will continue to be silenced by those who break the law without fear– for there is no consequence. Without consequence, Democrats will continue to win elections by the narrowest of margins.